If you’re boating out at sea, you may have an interest in fishing in order to be self-sufficient and to find food instead of having to go to the supermarket for it. However, even if you’re not particularly keen on fishing, you might be surprised at the number of people who enjoy coastal foraging. These are people who scour the shoreline of British beaches searching for edible things to cook. 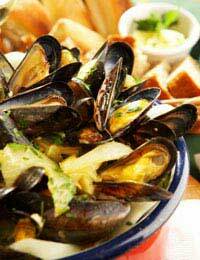 Wild mussels are a common sight which you will find on some shorelines in the UK attached to rocks. You can recognise them from their blue-ish hue and they are often shaped like a human ear. You can distinguish the bad ones from the good by placing them in a bowl of cold water as the bad ones will float. Also, any that are already open you should throw away. These should be cooked by boiling them and they make a great ingredient in things like stews and soups. They are also a perfect accompaniment to rice, pasta and salad dishes. Rock samphire is a plant that can be found growing on some native UK shorelines and it looks similar to asparagus tips. You can steam it or boil it and it makes a perfect salad accompaniment to any seafood dish. Sea kale resembles a sprouting broccoli plant and you can usually find it growing between rocks on the shoreline. You’ll notice that it has waxy leaves which help to keep it waterproof. Like asparagus, it is lovely cooked with a bit of butter. Razor clams are named after their shape which is an elongated shell which resembles a cut throat razor. They bury themselves in the sand with just their siphon sticking out and are quite common on Cornish beaches. Once you’ve opened them up and washed any sand off them, you can fry them in a bit of olive oil. They’ll curl up a bit like bacon but are very tasty pan fried with a bit of lemon added to them. Cockles are the brown or white shells we more commonly term as ‘sea-shells’. They bury themselves in the sand to avoid predators but are a very good alternative to the more expensive clams and can be uncovered by using a rake. On some beaches, public cockle picking is not allowed or there are strict quota limits on what you can take. They must be thoroughly rinsed and, once again, discard any where the shells are already open. You can steam them with garlic, wine or fresh vegetables and they are ready to eat when the shells open. Laver is a type of seaweed more commonly found on Welsh and Cornish shorelines. It looks like a large piece of green or brown plastic sheeting which sticks to large boulders and rocks. People will often collect a carrier bag full and it needs to be thoroughly rinsed to get rid of the sand and any remnants of shells that might be contained within it. Many people like to mince it up and make small patties out of it which can be fried alongside bacon and this makes for a nice breakfast. These are just a few of the food items you can find on a beach that are edible. A good tip is to buy yourself a book on coastal foraging so that you can identify all of the edible things you can find on a shoreline along with those you should not eat. These books will also tell you how to cook and prepare each item and will often contain mouth watering recipes. Although some people might not want to ‘live off the shoreline’ permanently, there is something very satisfying about cooking and eating natural foods that you’ve gathered yourself.